Packaged for resale in packs of 10 with 10 sheets of tracing paper and a how to do leaflet. 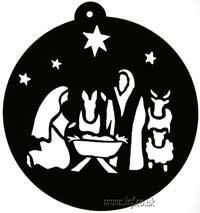 Nativity manger scene cut out. A 20 cm laser cut disk in a light weight dark coloured card. Tracing paper can be stuck behind the image and coloured in with felt pens, or tissue paper can be stuck behind the card to give a stained glass effect.